The other day we wrapped some tin foil in noodles. I thought they made for a pretty stylish necklace. 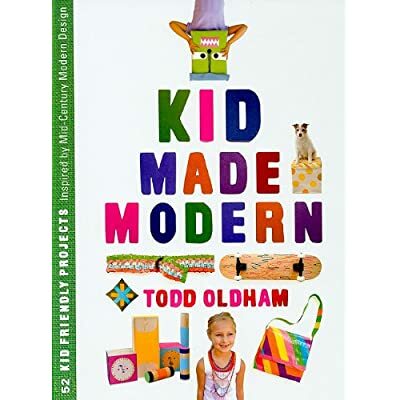 The project came from Todd Oldham’s awesome book Kid Made Modern . His first book, Handmade Made Modern, was decent, but this one is super fantstic. I think it’s aimed at kids around the ages 7-12, but there are some projects little ones can do and I would have loved it as a teenager–really even if you don’t have kids there are some super styish ideas you can steal. In the book, Oldham takes mid century designers–Isamu Noguchi, Marimekko, Alexander Calder, Paul Rand, Charles and Rae Eames and so many more–tells you a little about them and their art and then presents a couple projects inspired by their work. The projects are organized by material–many of them recycled–or technique. The printing, cardboard, tape and dye sections are some of my favorites, but I was taken by most of the projects. I didn’t mean for this to become a full on book review (I was just going to tell you about the noodles) but I think this is a fantastic craft book that is well put together and well thought out. And definitely not only for kids. If you feel like wrapping noodles in tin foil–you really don’t need the book for this project– but I would dab a little bit of glue on the noodle before you roll it up. We didn’t and I kept finding bits of tin foil around the house for the rest of the week. Oh and look there is a kid made modern website with some extra projects and little videos, check it out! Posted in kid art, library. Thanks for the heads-up! Didn’t know about this book. Glad to see I’m ahead of the curve on this one: I’ve long advocated wrapping things in tin foil. Try wrapping up their hats. It helps block Venusian thought-control transmissions. ahhh. very cool. love it. Thanks for the recommendations. I placed both on hold at the library. Thanks for reminding me that I have this book! (And the first one. Long, long ago my husband and I made the bedside tables and bench from it.) Too bad my kid is still young enough that I’d have to dig foil out of his mouth if I tried it with him.